Habits are the most important part of our daily life. Habits can either make you, or break you! The choice, is always yours to make. It decides the kind of person you are and you will be, be it an athlete, a businessman or anyone in this world. Scientific studies, shows that it takes only 21 days for a person to cultivate a new habit. Isn't that exciting!! I bet you're smiling right now, thinking it sounds so damn easy. 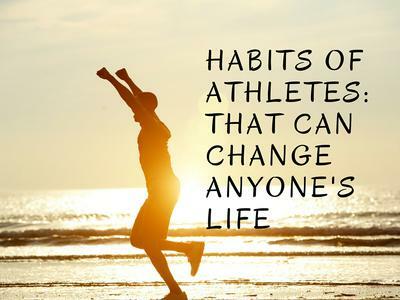 Then why not pursue some awesome habits of successful athletes? Going to a gym without setting goals is like throwing darts blindfolded. It's not just applicable for gym, but, for the rest of the things in life as well. This will make you wander places without getting anywhere. The best way athletes achieve results is by setting goals with a timeline set. It will always keep you on an edge and make you work harder towards it. Start a diary and note things down, go through them daily. Let others know, so you have a public pressure to cope up with. It will help you remain focussed. Modify your goals time to time. Your goals will be your light in the dark. Never get discouraged if you are not able to progress as planned. Great things need time. Be patient like the highly effective athletes! When things go wrong, don't stop, keep fighting. To be able to believe in your abilities when things don't work your way, make you stronger and better. Enjoy the process on the way. At the end everything will be worth it. Don't make eating anything and everything all the time a habit. It's definitely not a good one. That will undoubtedly turn you into a fatty. We don't want that to happen. We care about you! All the good athletes plan their meals in advance. Because your body is like a machine, it needs good fuel to work efficiently. And, when it comes to fuel, on what does your car work?? Kerosene, vegetable oil? No? It may or may not work, but will for sure harm the car. Then why do you want to consume fast food? More than good, it only causes harm to your body. All you need to do is eat three proper meals with smaller meals in between. Pledge to eating healthy and nutritional food, even if it makes you look crazy. Make no excuse, stay strong! Morning is the best time to workout. The chance to cancel your plans are almost zero. There is no better way to keep your mind clear and healthy. And, this is where your honesty and commitment to be a better you comes. Healthy body and mind is achieved over time with consistent training. Trying to push yourself beyond your limits. To break your own records. To look into the mirror, and to be able to see the difference in yourself. Highly effective athletes keep records of performance and other relevant information. They not only just train. but, take their time to recover. They focus on every little detail, making them different from others. Maintaining good hygiene is as important as the workout. Fungal infections can appear almost anywhere on the skin when you sweat a lot. The best way to deal with such a condition is to wash your face regularly with natural antibacterial defense gym soap, which does not contain Triclosan. Stay safe! This proverb says it all. It's like a mantra followed by every successful person on this planet. It can be a real challenge for most people. But, to wake up early have various physical and mental benefits, which you can get to enjoy throughout the day. You will have time to workout in morning, which you won't blow off. In return, it will keep you focused, put you in a happy mood for the rest of the day and make you feel accomplished. You will have more time to do things, which will increase your productivity. And, the best part of all, more time to bath with your favorite antibacterial gym soap after workout. And, Breakfast too!! Yum! You will also sleep so much better at night. Isn't that perfect? No one is perfect we understand! But life becomes a little better when we inculcate habits that makes us a healthier person and, others life a little happier. 21 days are waiting for you, go folks!! Evie Dawson is a fitness coach and health writer based in Boston, MA. Her passion is to encourage others to rediscover their lifestyle and get inspired for organic living. Join in and write your own page! It's easy to do. How? Simply click here to return to Weight Training.